For most of us, the Mac Pro is unattainable at $2,500 and up. The Mac mini offers good performance but limited expansion at $600. And Apple seems set against anything between those two models except for the all-in-one iMac. This leave those of us who want two internal hard drives and an internal SuperDrive out in the cold. At present, the only option we have is an external hard drive. Remember the G4 Cube? Introduced in July 2000, it was one of the most beautiful computers ever released by anyone - and almost as limited in expansion options as the Mac mini. The Cube had one 3.5" hard drive bay, one slot-loading optical drive bay, and an AGP 2x slot for its video card. There were no extra drive bays or PCI slots for adding new features. You could put in a bigger, faster hard drive. You could install a faster CPU or two. And you could put in a more powerful video card. All of these made the Cube hotter, and PowerLogix came to the rescue with its PowerCube enclosures, which improved ventilation but didn't improve its expansion options. The 2009 Mac mini with Nvidia GeForce 9400M graphics is a good machine, although far less expandable than the Cube. There is no video card slot, so you're stuck with the pretty good GeForce graphics. There's no room for a third drive, so you're limited to two hard drives or one hard drive and a SuperDrive. It may be possible to transplant a faster CPU. In its latest incarnation, the Mac mini has two SATA ports on its motherboard, along with five USB 2.0 ports and one FireWire 800 port. These SATA II ports do not appear to support port multiplication, a feature common in the PC world that allows the use of two to five SATA drives with a single port. In short, the current Mac mini is limited to two SATA drives. Ever since the first Mac mini shipped in 2005, there have been a host of third-party companion drives available, which made it easy to add an external 3.5" drive for more storage and speed. Most of these also include USB 2.0 and FireWire hubs, making them great peripherals. 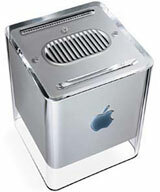 What if someone were to design a replacement chassis for the Mac mini? What is the potential? Without port multiplication, it would be possible to add more drives using USB or FireWire. FireWire 800 is significantly faster than USB 2.0, and since we're designing for performance, let's go that route. NewerTech already sells the miniStack v3, which includes one 3.5" SATA drive bay, a USB 2.0 hub, and a FireWire 800/400 hub. It retails for $110 with no drive or software. With 5 USB ports on the back of the Mac mini, we could probably dispense with the additional USB hub. Let's design the new enclosure to support two 3.5" SATA hard drives and the Mini's SuperDrive. Two of the drives could connect to the SATA ports, and the third could use a FireWire 800-to-SATA adapter connected to the FireWire hub. For backward compatibility, make sure there's at least one FireWire 400 port. Instead of a 2" high Mac mini plus two 1.5" high companion drives - the only way to add two 3.5" hard drives - the replacement chassis would probably be 4.0" to 4.5" high. It could use the Mac mini power supply to power the motherboard and SuperDrive along with a secondary power supply to power the hard drives. Perhaps it could also be offered with a unified power supply at extra cost. And with a second FireWire-to-SATA connector (again at extra cost), you could also use the Mini's original 2.5" notebook hard drive. Looking at prices for external dual-drive enclosures as well as Mac mini companion drives, I suspect that this modification kit could retail for US$199 - and possibly as little as US$149. Except for the enclosure itself, all the pieces to make this already exist. I suspect this would become a serious alternative for performance-minded Mac users who want a bit more than the Mac mini offers. It has a second hard drive for RAID or Time Machine, and 3.5" drives tend to be faster, higher capacity, and less costly than notebook drives. This could put a dent in Mac mini Server sales while creating a larger overall market for the Mac mini. As much as I love NewerTech's miniStack drives, I would find a Mac mini with two internal 3.5" drive bays a far more attractive option.